Only released in European territories. Inferior to the original GameCube version in several ways - including poor optimization, improper sound mixing, severe screen tearing, and poor controller support. Can change between 30 FPS and 60 FPS. Use this Patch to replace the 1600x1200 launcher preset with 1920x1080, 2560x1440 or 3840x2160. Replace all files in the installation folder. Enabling debug mode allows you to adjust the resolution while the game is running. You are still limited to the Launcher's preset 4:3 resolutions even when using debug mode. Pressing F1 while debug mode is active allows you to control the camera with a mouse. 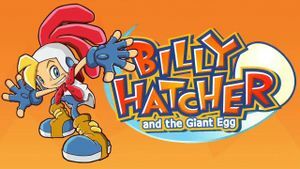 Go to %appdata%\Sega\Billy Hatcher and open gegg.ini. Under Details, change SECRET=0 to SECRET=1. Start the game and press Esc to open the Debug menu. Press F2 to increase resolution or F3 to decrease resolution. Mouse buttons can not be remapped. To use the mouse to control the camera, see Debug menu. Includes XInput and DirectInput controller support - albeit very limited. XInput controllers cannot remap the triggers (blocked, used for the camera) or analogue sticks (left one for movement, right one is unused). Button prompts directly ported from GameCube version. Must choose between controller or keyboard in the launcher. Audio options are limited to High, Middle and Low. All dialogue is displayed in text form. Utilising the Widescreen Patch results in severe graphical glitches in Multiplayer. DirectSound3D May require DirectSound 3D restoration software. In-game movies require a CPU with SSE support. This page was last edited on 20 April 2019, at 03:49.